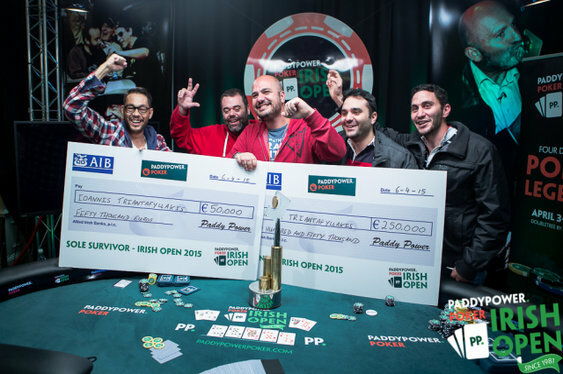 The 2015 Irish Poker Open finally reached a conclusion last night and when the betting was over it wasn't a local lad lifting the title but Greek grinder, Ioannis Triantafyllakis. At the start of the final session it was local legend, Donnacha O'Dea leading the way, but after a mixture of luck (including an epic slowroll), the Irish poker legend was unable to parlay the previous day's momentum into a winning run. After watching O'Dea fall in fifth place, it looked as though fellow Irishman Kevin Killeen would be the man taking home Europe's oldest title. Having previously enjoyed success in Dublin courtesy of UKIPT, Killeen was in a buoyant mood by the time he found himself heads-up with Triantafyllakis. Cheered on by the crowd, Killen agreed to a deal which saw his opponent lock up €197,500 ($215,852) while he secured €192,500 ($210,251). That deal left €12,000 ($13,106) and the coveted Irish Poker Open title to play for and when the action got underway it was Triantafyllakis who moved into a commanding lead. After a continued pressure from the Greek, Killeen eventually submitted and committed his chips with As 2c. Following a raise by Triantafyllakis with Qs Tc, Killen made the call but couldn't hold on to his lead and eventually hit the rail in second place after the board ran out: 7c 4c Qd 7h 3h. As the pot was pushed his way, a jubilant Triantafyllakis was handed a winner's check for €197,500 ($215,852) plus a further check for €50,000 ($54,918) courtesy of Paddy Power. The Greek player managed to qualify online via the Irish site which meant he pocketed the Sole Survivor bonus and the biggest win of his career.